Are the sockets in your Brighton and Hove homes outdated or simply just not functioning properly? If so, Electrics on-Tap are the professionals you need to contact to receive top-of-the-line electrical services. Our team consists of a variety of experts with years of experience working across various types of electrical issues. 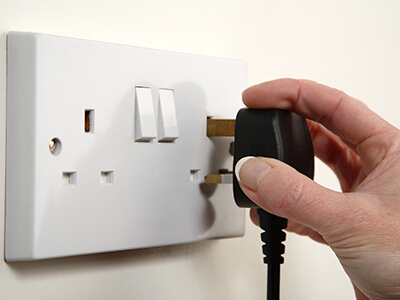 No matter what type of socket you would like fixed or replaced, Electrics On-Tap has got you covered. Simply call us today on 01273-723600 to arrange a visit to your property and we will deliver services that will provide lasting results. What sort of sockets do we install on Sussex properties? Electrics On-Tap has been serving residents of Sussex for many years now. In that time, we have made a name for ourselves through our commitment to delivering the highest quality services with the highest quality products. When you call on us to install a socket in your home, we will provide the finest electrical products from some of the biggest and best brands in the business. Electrics On-Tap only uses electrical products that are tested and trusted and can provide an electrical socket that will serve you perfectly for years to come. Before we install a socket in your home, we will first verify what sort of appliances you intend on using. This way, we can install a socket for you that can work as hard as you need it to, without having any worries. Rest assured, all our services are available at budget-friendly prices, so contact us now via our contact form, for a free, no-obligation quote. Where do we install sockets? Our experts at Electrics On-Tap have the expertise and equipment to install a variety of sockets in any room of your Brighton and Hove property. We serve not only residential properties, but also commercial ones. If you want a powerful socket that will be used on a regular basis and can carry huge loads, call us now on 01273-723600. Our socket installation services are not just for the indoors. We can also help you neatly install sockets in an outdoor location of your choice. This way, while relaxing in your front yard or working in your garden or tool-shed, you can conveniently access all the electricity you need. At Electrics On-Tap, we deliver our services with a customer-first approach. This way, we can ensure your absolute convenience while we provide our services. Once you call us, we will arrive at your property as soon as you we’re needed. Because we work with state-of-the-art equipment and our technicians are highly trained, we can quickly diagnose the root-cause of your property’s electrical problem and have it resolved FAST. Not only do we work quickly, we also work neatly. By the time Electrics On-Tap is finished working on your sockets, there will be no mess and all wires will be safely tucked away. We provide this fast and efficient service to all Brighton and Hove clients, regardless of how complex, large or simple the task. When you hire Electrics On-Tap, you can relax, knowing you are in competent and safe hands. We want you to enjoy the utmost comfort in your home at all times. Electrics On-Tap is fully compliant with the 17th Edition Wiring Regulations BS 7671 and BS 5266. We are NICEIC-accredited, meaning we are certified to perform electrical services of the highest standards. Our installations are also compliant to the Part P Building Regulations. Every member of staff has received special training and is more than capable of delivering a polite and effective service that will keep your property properly wired all year round. Our goal is to provide highly efficient and perfectly safe electrical installations for our clients at an affordable price. We are able to deliver high-quality services at competitive prices because of the special relationship we have with our suppliers. 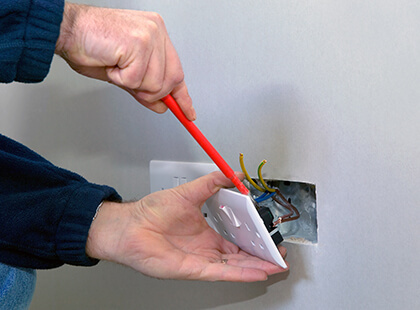 This way, we can install high-quality sockets in your home at some of the best prices you can find in Sussex. Whatever electrical service you need, we can provide it to you at a price within your budget. Contact us right now via our contact form for a free, no-obligation quote. Let Electrics On-Tap be your trusted electrician for socket repair and upgrades in Brighton and Hove. Electrics On-Tap wants you to have a happy and safe home. The best way we can guarantee this is by ensuring every aspect of your electrical wiring is operating safely and at optimal performance. Our team of technicians are certified by major electrical regulators across the UK, so be assured that we can deliver on electrical services as promised. 100% customer satisfaction and guaranteed excellent service. Because your satisfaction is our priority, all socket installation and repair services will be delivered only by our trusted and specially-trained, in-house professionals. Never will we outsource the fixing of your electrical issues to a third party. We are also available to provide professional guidance about which sockets might be most suitable for specific rooms and purposes. Our staff are just as polite and friendly as the pricing of our services. Request a free quote today or call us now on 01273-723600 or 01903-660093 for exemplary electrical socket installation or repair in Sussex. Electrics On Tap offers Extra Socket/Switch Fittings services in Brighton, which is located in South East England, and a large town in the county of East Sussex. Hove, Mile Oak, Moulsecoomb, Hollingbury and Hollingdean are included withinin Electrics On Tap’s Extra Socket/Switch Fittings service area in the City of Brighton and Hove. Last in order of mention, Electrics On Tap’s Extra Socket/Switch Fittings services cover the Brighton Municipality along with Stanmer, Bear Road area and Brighton Marina.